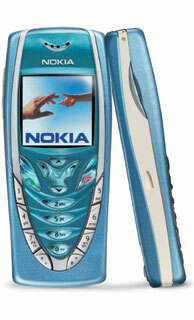 The Nokia 7210 is a new color-screen tri-band GPRS phone that promises to offer the goodness of Nokia’s cell phone design with the novelty of a color display. Thanks to Jeff Setton for lending me the 7210. Note that the section concerning incoming audio has been updated since the original review was written. The menu system in the phone is pure Nokia, which is a good thing. The firmware appears to be a direct descendant of the 7190, which means terrific phonebook functionality, as well as other features such as calendar with alarms, To-Do list, user-defined SMS folders, top-notch T9 implementation, stopwatch, alarm clock, and currency converter. Nokia didn’t really bother to do much to make the menu work better with the color screen however, so don’t expect anything different from what you see on monochrome Nokia models. My initial feelings of the phone’s utility were immediately derailed by the keypad. It is fairly clear that it’s been designed for looks and not for functionality. The key placement is horrible, and while I’m sure you’d actually get used to it over time, the word ergonomic is about the furthest from describing the layout. Key feel was okay, but it wasn’t stellar. In terms of looks, the phone follows the boxy-small design started with phones such as the 33xx series, but size and weight are closer to that of the 8390 than the 3390. The phone tips the scales at 83 grams. I had no complaint with the overall design of the casing, but it didn’t strike me as particularly beautiful. Battery life claims made by Nokia are (as usual) rather optimistic. With only a 720-mAh (lithium ion) battery, I sincerely doubt you’ll get 5 hours of talk time or 12.5 days of standby. This is especially true if you use the screen backlight frequently, which is absolutely necessary on color screens of this type. The color screen is quite nice, with bright and (almost) vibrant colors. However, all of the images seemed vaguely out of focus. Text looked fine, but the images provided by Nokia had been seriously anti-aliased to prevent ramping. I’m glad to report that the 7210 actually has an excellent ringer. Unlike many other phones that offer polyphonic ringtones, the 7210 also offers standard ringtones that are good-and-loud. Except for the placement of the ringer on the side of the phone near the bottom (a dumb idea copied from the 7190), the ringer will most certainly be audible over just about any type of background noise. The phone also includes a built-in FM radio, and the sound quality of this radio is excellent. I didn’t have much of a chance to test the RF capabilities of the receiver, such as its resistance to multipath, but I did note that its RF sensitivity was well below that of my Pioneer car stereo. For local stations however, the sound quality and volume of the radio is terrific. Data connectivity is provided via infrared and cable connections. The 7210 does not offer Bluetooth, which is a major omission for a phone selling in its price class. I’m guessing that tethered data users weren’t really the focus of this design. RF performance is okay, but not particularly great. During my short test of the 7210 it was compared to a Nokia 6190, a Nokia 7190, a Nokia 8390, and a Nokia 3590. All four of those phones performed better than the 7210, especially when it came to locking onto a weak signal and holding it. The 7210 frequently had trouble finding service when the signal was weak, and it would often loose service once it had found it. In-call performance wasn’t bad though, and it held its own against the other 4 Nokia models. Just the same, it wasn’t quite as good when the signals got really weak, and audio break-up was more of a problem. Outgoing audio quality is quite nice. Jeff called me a number of times from the 7210, and his voice sounded just as good as it did on his various other phones, including a Motorola P280. Incoming audio on the original 7210s was horrible, and my first review said just that. However, it was suggested to me that the version of the 7210 being sold by Fido was actually much better, and so I took a trip to my local Fido kiosk at Square One to find out for myself. For those hoping that I'm going to say that the 7210 has great audio, I'm afraid I'm going to have to disappoint you. However, there is no question that the 7210 I tried at the kiosk was greatly improved over the one I'd originally reviewed. For the most part, the intermodulation distortion was gone, but not completely. What remained was fairly tame, but at the same time the earpiece produced a constant background hiss that was actually quite pronounced. Normally you can't hear hiss over the background of a busy shopping mall, but it was clearly audible even under those conditions. I can only imagine how it sounds in a quiet room. Maximum audio volume was disappointingly low. So even though the audio was improved over the earlier 7210 that I tested, the ones being sold by Fido are definitely not going to appeal to anyone who values this audio quality. That isn't to say that the 7210 sound awful, and I'm sure that many people will find it quite acceptable to their tastes. Despite the lackluster earpiece audio, the phone provides a minimal speakerphone function that actually works reasonably well (in quiet environments at any rate). The audio quality of the speakerphone is quite acceptable, but as I noted, the volume isn’t high enough for use anywhere but in quite places. This is only a mini-review, which means I didn’t get all that much time to play with the phone. However, I was so floored by the awful audio quality and ridiculous keypad layout that I couldn’t imagine using a 7210 even if someone paid me. It’s too bad really, since the phone has so much to offer otherwise.